Held at The Mill at Lebanon! Held on East Main Street in Lebanon, TN! Held on the Lebanon Town Square! Held on the West Lawn of Wilson Bank & Trust! The West Lawn of Wilson Bank & Trust! After tremendous public response at the first-ever ‘Taste of Wilson County’ event last fall, organizers were encouraged and excited to make this year’s event even better on October 13th. Once again, event proceeds benefited Lebanon/Wilson County Chamber’s education programs. Guests had the opportunity to mingle with local chefs, sample some of the area’s best food and enjoy live music, with even shop for special goodies at the marketplace. This year also featured an expaned Kid's Zone - with bouncies and art classes. Another new feature was the Fashion Show. Local celebrities did their own version of "what not to wear" with models ranging from young children to adult men and women. Although the kids stole the show, everyone had a great time. Taste of Wilson County also hosted an icecream making contest near the main entrance. Competitors actually made their icecream on site! The Market Place was another great hit - with lots of different businesses represented. At the end of the night, over $16,000 from the event went to fund various Chamber Education Programs, including Wilson Books from Birth, TN Scholars, the Teacher Grant Program and area scholarships. Tickets for ‘Taste of Wilson County’ will go on sale in early fall. See photos from last year online, and vendors can check back soon for easy online. Bid on this original piece of art by R. Scott Harris, commissioned especially for Taste Of Wilson County. Kids can stay busy creating their own paintings and enjoy inflatable fun! is year’s marketplace has expanded to feature many unique gifts and goodies. here is plenty of self-parking at Wilson Bank & Trust, Rochelle, McCulloch & Aulds, as well as the City of Lebanon. Trolleys will run every 15 minutes from 4:30-8:30 pm. Valet parking is also available for a $5.00 donation. Valet parking is limited, so please arrive early! The Taste of Wilson County event is a great opportunity to gather many of the best restaurants and catereers from across Middle Tennessee - including Mt. Juliet, Lebanon, and Watertown -in one location to sample their signature foods. You'll find everything from catereers to the neighborhood grill, pizza to ice-cream, cajun to coffee! Each participant will have a sample of some of their best dishes for you to sample and enjoy - so come early and bring your appetite! And if the food was not reason enough, theTaste of Wilson County will also be raising funds for the Wilson County Education Coalition! The Education Coalition helps to fund programs like Books From Birth (visit the Books From Birth Website here), and Tennessee Scholars State School Initiative (vist the TN Scholars website here). You can purchase tickets in advance from the participating restaurants, or from the Lebanon / Wilson County Chamber of Commerce office on the square in Lebanon. Tickets are also available at all Wilson Bank & Trust branches! After tremendous public response at the first-ever ‘Taste of Wilson County’ event last fall, organizers are getting a head start to make this year’s event even better on October 14. More than 1,200 tickets were sold last year for ‘Taste of Wilson County,’ with proceeds benefiting Lebanon/Wilson County Chamber’s education programs. Guests had the opportunity to mingle with local chefs, sample some of the area’s best food and enjoy live music, with culinary offerings from more than 30 area vendors included in the ticket price. 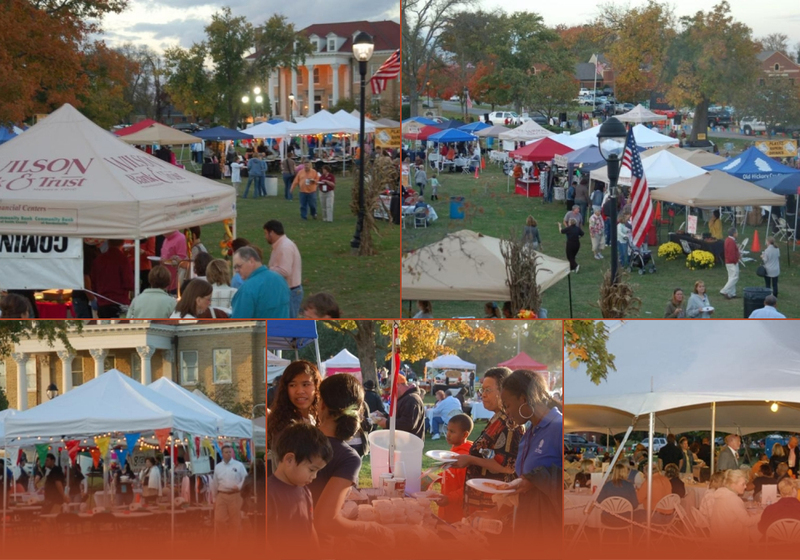 ‘Taste’ partners Wilson Bank & Trust, Performance Foodservice and the Lebanon/Wilson County Chamber of Commerce are planning for another successful event this October, and will be adding some upgrades in response to last year’s remarkable support and overflow crowds. Among the planned improvements are double the venue space for guests and vendors at the Mill in Lebanon, as well as double the choices for parking, including a valet option. Attendees to the 2010 event will enjoy the "Taste Marketplace," where vendors will display and sell their signature sauces, gift baskets and other food-related items. This year’s entertainment line-up will include ice carving and fruit carving demonstrations. Over $9,000 from last year’s event went to fund various Chamber Education Programs, including Wilson Books from Birth, TN Scholars, the Teacher Grant Program and area scholarships. Purchase tickets at Wilson Bank & Trust offices or the Lebanon/Wilson Chamber of Commerce office! Attend the event to bid on this piece of artwork from Lebanon’s own R. Scott Harris, commissioned especially for Taste Of Wilson County. Unique gifts and goodies will be available for purchase from participating eateries as well as non-food vendors, and legendary songwriter Curly Putman will be on hand to sign copies of his new book, Faces in the Clouds. Kids can stay busy creating their very own paintings with R. Scott Harris - just pre-register through the Art Mill at 444-8828. Kid-friendly foods will also be served throughout the event. In addition to self-parking at The Mill and Liberty State Bank, we will also have trolleys running to the parking lots at the Music City Train Station, First United Methodist Church, and Bank of America. Trolleys will run every 15 minutes from 4:30 - 8:30 p.m.
For a $5.00 donation to the Chamber Education Programs you can arrive at the front door and leave your car with our valet service. Valet parking will be limited, so please arrive early or use one of our other parking options! The first annual Taste of Wilson County is over - and we'd like to thank EVERYONE that made it such a HUGE success. Please visit the PHOTOS page for some pictures of the event! Despite the weather and moving the event just days before hand, we had an amazing turnout - over 1,200 tickets were sold! Thank you to everyone that came out, although the weather outside was dreary and miserable, inside The Mill was beautiful and filled with the amazing aromas of food from all across Wilson County! Our final count was 31 restaurants and caters - and their food was amazing! Their efforts made this event successful - they were well prepared and even with the incredible crowds they managed to keep up and serve everyone! The sponsors and event organizers were also a key to the success of Taste of Wilson County. Although this was the first annual production they made sure that everything went as smoothly as possible. A great deal of planning and preparation went on for months prior to the event to make sure this event was a success. Thank you to everyone that helped make the first annual Taste of Wilson County a great success - and we look forward to seeing you next year!